Miss Bates’ determination to read inspirational romance is quixotic. (It hasn’t been in vain: there’re last Christmas’s Lacy Williams and Karen Kirst discoveries). Most of her inspirational reads have been duds at worse; “okay” at best. And yet, there goes Miss B., tilting at reader windmills. That the combination of faith in love and God may be conjoined in a romance narrative persists in Miss B’s “this can work” universe. 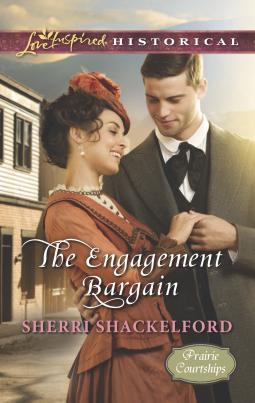 Her latest inspie read, Sherri Shackelford’s The Engagement Bargain, proved to Miss B., once again, the marriage of faith and romantic love, as defined by the inspirational subgenre, is elusive. There was much to like in Shackelford’s effort and much not to. To start, Miss Bates liked the premise, the build-up. Small-town veterinarian Caleb McCoy escorts his sister, JoBeth, to a suffragist rally in late 19th-century Kansas City. Caleb is mesmerized by the speaker, determined, committed, and beautiful Anna Bishop. Anna’s impassioned speech is barely underway when she is shot. Caleb carries her to the nearby Savoy Hotel to succor and heal her. Caleb and Jo continue to care for weakened Anna; Caleb has fierce and uncomfortable urges to protect her. Anna, used to her independence, is discomfited by her reliance on Caleb, but can’t deny how safe and cared for he helps her feel. An unsavory Pinkerton detective shows up; another attempt is made on Anna’s life. The usually reticent Caleb, drawn more and more to Anna’s intelligence, blue eyes, and bearing up under fear and danger, offers to take her to his home town, Cimarron Springs, under the guise of being his fiancée. She will be cared for by his family and her safety assured. “That’s my job,” he grumbled. “Animals don’t expect small talk.” … He wasn’t a man who sought attention. He wasn’t a man who liked crowds … He wasn’t good with people … He never missed the opportunity to remain silent in a group, letting others carry the conversation. Caleb is not shy, but self-effacing. He’s a gentle man whose care for animals makes him as careful with people. There are lovely scenes, such as his taking in of newborn kittens. Several hilarious scenes around a goat-runt Caleb is bamboozled into sheltering, who develops a peculiar attachment to Anna. Caleb carries some past hurts that have rendered him reticent around women. Anna’s prestige, in turn, makes him even more reluctant to propose a relationship to her. But he’s a steadfast, loyal friend who shares his feelings, giving her the freedom to choose what she’ll do about them, if anything (he does the same when it come to Anna’s church attendance; this was refreshing, given the subgenre’s propensity to insist on the conversion of hero, or heroine). Miss Bates hopes she hasn’t made Caleb sound like a stick-in-the-mud because he’s not. He’s charming, funny, and loving. In Cimarron Springs, Anna finds a new set of values to adhere to, ones more in keeping with what her heart dictates instead of her mother. Miss Bates wishes, however, they weren’t puerile and simplistic, such as “As the door swung open, she recalled her embroidery and quickly shoved the evidence beneath her pillow. For reasons she couldn’t explain, she kept the feminine hobby to herself.” It seems that an appreciation of the domestic arts are Anna’s way of repudiating her mother’s view of them as demeaning, “Oddly enough, polishing the floor had given her the same sense of accomplishment as giving a speech. There was pride in a job well done, no matter what the job.” Shackelford’s point is a humble, true one: no job is beneath us, “small changes were just as good as grand gestures,” the quiet life of service IS of value. Miss Bates doesn’t fault Shackelford for this perspective; she wishes, however, that it didn’t have to be made by creating yet another evil, man-hating, emotionally distant mother, especially when that mother works for one of the greatest of women’s causes. To give credit where it’s due, Anna, in the end, doesn’t reject the movement; she redefines it, continues to work for it, and wins her HEA with Caleb. … This was not at all how she’d been taught to argue. A disagreement was absolutely a war. Battle lines were drawn, troops mustered for the opposing sides. Words were fired like gunshots, aimed to inflict the most damage … Anna realized the true folly of what she’d been taught all her life. Caleb teaches Anna there’s a different way of being with other people. He shows her men are not the enemy, though the narrative doesn’t deny many were. It also portrays the wrongs and abuse women suffered who upheld the cause of women’s rights. Caleb breaks every mold her mother taught her. He does so because he embodies Christian values, not expressly masculine ones: love, sacrifice, forgiveness, and atonement. This conciliatory way of relating to others contrasts with Victoria Bishop’s antagonistic divisiveness. As far as messages go, it’s an attractive one; Miss Bates wishes it weren’t made with the underlying assumption that feminism carries acrimonious animosity. Sherri Shackelford’s The Engagement Bargain is, as Miss Austen says, “almost pretty,” Northanger Abbey. The Engagement Bargain, published by Harlequin, has been available since February 3rd, in “e” and paper, at your favourite vendors. Miss Bates is grateful to Harlequin for an e-ARC, via Netgalley. It’s weird. I’m fairly consciously a feminist, yet based on your review, this book is more attractive to me than to you. There are people like Anna’s mother in any movement, feminism included. For me, radical feminists, especially trans exclusionary radical feminists, are almost as problematic, and equally laughable, as men’s rights activists and other misogynists. Your description of Caleb makes him sound really appealing, and the book doesn’t sound preachy or anti-suffragette. Far too many romances — especially contemporaries — have extreme, wince-inducing setups and implicitly or explicitly anti- or non-feminist assumptions about the world. This sounds like a refreshing change of pace. Whether I read it or not depends on whether I can easily find it through my library, though. I liked her writing. The animals, especially the goat, Pipsqueak, is adorable. She’s most definitely not anti-suffragist, au contraire, but I did find the mother’s portrait was a jarring element for me. You might very well enjoy it, it’s true! I’m not a big reader of Christian romance, but this sounds pretty good. Elizabeth Camden writes inspirationals that are not heavy handed at all. I really enjoyed “Against the Tide”. Shackelford’s romance has some lovely elements to it: the humour and a wonderful hero. I’ve read Camden, the Chicago-Fire-set-one and liked it very much. I think you’d also like Against the Tide. I haven’t read the one you read. Yes, I have that one in the Reeling TBR! I am very picky about inspirational romances, more often than not they do not work for me, but I can recommend one: “Maid to Match” by Deeanne Gist. I have a huge soft spot for the location used in the book because I am a frequent visitor to Asheville, NC and Biltmore House. I thought she did a great job with the story, the history and the message. I’ve been disappointed by inspies often enough that I avoid most of them, but your review piqued my interest enough to order this book. I’ll take a chance on nearly any novel that combines faith and feminism, two of my favourite topics! I’m going to love hearing your thoughts. I wish the mother had been portrayed in a more nuanced fashion. But there are things to like & there’s some nice humour. Tweet me some thoughts if you have a chance … ! I liked this a lot. Maybe even more than you did. I was disappointed in the mother, too. I was expecting her to have a backstory involving some terrible treatment at the hands of one man (Anna’s father) which would have given her a personal animosity against men. Because I do agree that it was a one-sided depiction of the feminist movement, although it was very good to see Anna continuing it in her own way in the epilogue. But I forgave her that because I loved Caleb and Anna’s story so much. And I liked that Anna was allowed to redefine herself through the story into a role that fitted her so much better than the position she held at the start of the book. And who wouldn’t want a Caleb at their back?! I’d certainly read more by Shackelford. I think the mother’s story (and yes, that would have made her attitude soooo much more palatable: see, writer you, knows what it needed) really stood out for me too much. Jarring into the narrative that made it unappealing. But all the things you liked about it, I liked too. Especially Caleb, who was so loveable and funny too: remember when he stepped in the cherry pie, or he tried to play knight in shining armor with his shotgun and managed to shoot through the window. Moreover, when things weren’t funny and light-hearted, like when he asked Anna to go to church: he wasn’t insistent and like it would break up his feelings for her if she didn’t. He gave her space and choices and was wonderfully portrayed. I didn’t want him to be used as a foil to the mother’s coldness. I’d read another Shackelford too.